I write today to let you know that your child’s grades are now available on the D-E website (you can follow the directions below if you need a reminder about how to access them). Please note that the comments in this report were written before spring break, and that no grades were attached to them at the time. Our hope was that students would make better meaning of them if they did not have the grade to distract them from the observations and advice that were being offered. We have left the comments on the report card for review and to be able to see them alongside the grade for conversation. As always, we hope that you will use these grades to talk with your child about the rest of the year, which has plenty of time left for improvement. Students in grades 9-11 have been working hard this week on making course selections for next year. Yesterday’s long advisory was spent on this process as well as looking at grades. Please be sure to talk with your child about his or her course choices, and feel free to call us and ask questions if you want. The final step of the process is a signed form that indicates your approval of the choices, just so we are sure that you have been involved in this conversation. We aim to have final course selections made by April 19. While the underclassmen were choosing courses yesterday, the seniors began their conversation about commencement and the end of the year. They are starting to choose student speakers and award winners, and talking about what the final weeks of high school will look like. It’s both exciting and a touch sad to think about the end of their Dwight-Englewood days, and we plan for these weeks to be the crescendo of their experience. 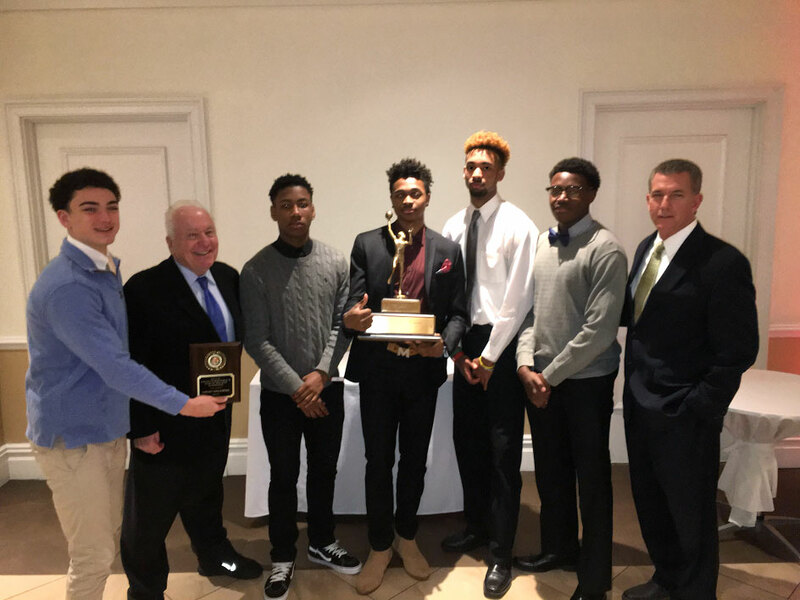 Go Bulldogs: At this year’s Bergen County Winter Sports Banquet held at the Fiesta in Wood-Ridge, the boys basketball team was presented with the Bergen County Coaches Association Trophy for the Group 1 – 2 Team of the Year. This award is presented to that team that distinguished themselves throughout the season in the Division, Bergen County Jamboree and in State Tournament. Among their accomplishments were Divisional Champions, State Section Semi-Finalist and a Quarter-Finalist in the Bergen County Jamboree. Here’s hoping for some spring weather soon. Have a great weekend. Go to the My DE area of the Dwight-Englewood School website by visiting www.d-e.org and clicking on My DE at the top-right of the page. Log-in to My DE using your assigned password or the password you established for yourself. If you need help with your password, please call Computer Services at 201-227-3177. Click on your child’s name near the top of the page. Click on Progress (if not already selected), then click on the current grade for your child immediately below that. After selecting the grade, click on the Report Cards link in the Performance area. You will see two links for the Spring Interim: Academic Report Card and Physical Education Report Card. When you click on either of those links, a pdf file that contains your child’s progress information will open in a new window. This file can be saved to your computer or printed directly from the screen. These reports will remain viewable while your child is enrolled in the School. Parents/guardians of students in Grades 6-11 are invited to join in “OVERexposed” – a timely and thought-provoking conversation with special visiting presenter Lauren Hersh. Earlier this year Ms. Hersh met with our MS and US students to discuss the complexities of social media, texting, and protecting privacy. This is a follow-up discussion for parents/guardians only. To RSVP for OVERexposed with Ms. Hersh click here. Questions may be directed by Email to: pa@d-e.org. On Monday, April 24, 2017 the College Counseling Office will host our Junior Families College Night. This special event with individual representatives from a broad range of colleges and universities is one of the most valuable experiences in the college search process. We seek your cooperation in emphasizing the importance of this evening to your student. The parent and student portion of the program will begin with registration and a welcome presentation in the Schenck Auditorium at 6:15 PM. Following opening remarks, there will be a panel discussion for parents. The evening will conclude with a college fair which will provide an opportunity for individual conversation with college admission representatives. Below please find a copy of the evening’s schedule. Attendance for students is mandatory, and we strongly encourage parents and students to attend. Please be reminded that this program is for D-E Junior families only. We are looking forward to an enjoyable and informative program. This is a gentle reminder that all medications for MS/US students must be deposited with me in the MS/US Nurse’s Office, for distribution during the school day, including over-the-counter medications such as ibuprofen or acetaminophen. D-E School Medication Forms, that authorize the administration of over-the-counter and any other medication that is to be given at school, at any time, can be found at www.d-e.org/enroll. This policy for proper procedure for medication administration is referenced in the 2016-2017 D-E Middle and Upper School Student Handbooks (please see page 19). Handbooks were distributed earlier this year; to download a PDF of the Handbook(s) please go to www.d-e.org/upper. The only exceptions are medications for asthma (inhaler), for other potentially life-threatening illnesses (insulin) or a life-threatening allergic reaction (epinephrine). For additional information on NJ State legal statute covering these rules, please click here. Let’s all work to maintain a safe environment for all students! Please contact me if you have any questions.